Movie Review ~ Hail, Caesar! Synopsis: A Hollywood fixer in the 1950s works to keep the studio’s stars in line. Review: Films by the Brothers Coen have always been a mixed bag for me. Like Woody Allen’s impressive roster of releases, I feel the Coens hit the bulls-eye every two movies or so. They aren’t all winners and as much as movie gurus implore you to like even their most misguided affairs (hello Burn After Reading!) I’ve just gotten used to the fact that I’m just not going to follow that pack and say I enjoy all of their work. Last represented (directorially) on screen in 2013 with the seriously underrated Inside Llewyn Davis, the Coens have gone Hollywood with their latest romp, a madcap paean to the golden age of cinema. Like those classic films of the ‘50s, it’s chock full of recognizable stars and has the pristine period-perfect production values we’ve come to expect from the Coens. Yet, like most mass-produced Hollywood fare produced during that era it’s curiously forgettable almost the instant you leave the theater. I’ve come to believe that any Coen Brothers movie can be edited to look like a crowd-pleasing spectacle and the early ads for Hail, Caesar! have certainly gave the impression there’s a lot of hijinks to be had and for once it wasn’t totally off the mark. Nicely lampooning the types of films and stars that came out of the studio system, cinephiles will rejoice at the Coens recreation of westerns, musicals, and historical epics. On the set of the biblical drama Hail, Caesar!, Baird Whitlock (George Clooney, Tomorrowland) is a handsome dimbulb about to be kidnapped and held for ransom by a pack of disgruntled communist screenwriters attempting to get back at the studio that reaps the financial benefit of their artistic contributions. It’s so very Coen Brothers to make this buttoned-up intelligent gang not the misunderstood members on the Hollywood blacklist but full-on Russian sympathizing commies. Several months after the problematic Trumbo gained so much attention for rehashing the dark days of the McCarthy hearings and the lasting effect they had in Hollywood, I must say it’s kind of refreshing to see this fictionalized band of writers presented as the total opposite of how we’d expect, considering the time and place. Meanwhile, in the adjacent studios we meet a cadre of classic Coen crazies like Scarlett Johansson (Under the Skin) as a beautiful Esther Williams-esque starlet, a mermaid on screen with a hard edge once her tail comes off. Then there’s Ralph Fiennes (Skyfall) as a frustrated serious film director forced to work with a yokel rising star (a hilariously spot-on Alden Ehrenreich, Beautiful Creatures) plucked from the set of a cowboy film to play the lead in a high society musical. Channing Tatum (The Hateful Eight) sings and tap-dances in an On the Town style musical nicely choreographed to be a little dirty and showcasing yet another undiscovered Tatum talent. Appearing all too briefly is Tilda Swinton (Only Lovers Left Alive) as twin gossip columnists seeking a scoop for their next column. Like her appearance in Trainwreck, Swinton dives headfirst into the character(s), leaving you wanting more in the best way possible. Frances McDormand (Promised Land), Jonah Hill (The Wolf of Wall Street), and even Wayne Knight (Jurassic Park), pop up for the briefest of cameos (why McDormand and Hill are above the title is beyond me) as various denizens involved with either the studio, the kidnapping, or both. Tying this all together is Josh Brolin’s (Oldboy) Eddie Mannix, employed by the studio to make sure their stars stay in line, their movies stay within budget, and all problems are kept under the rug. Loosely based on the notorious real-life Eddie Mannix from MGM, who some say was involved with Tinsel Towns most infamous unsolved crimes, Brolin’s Mannix is recast as the neutral core of the studio/film, the one people come to when they need help or advice. 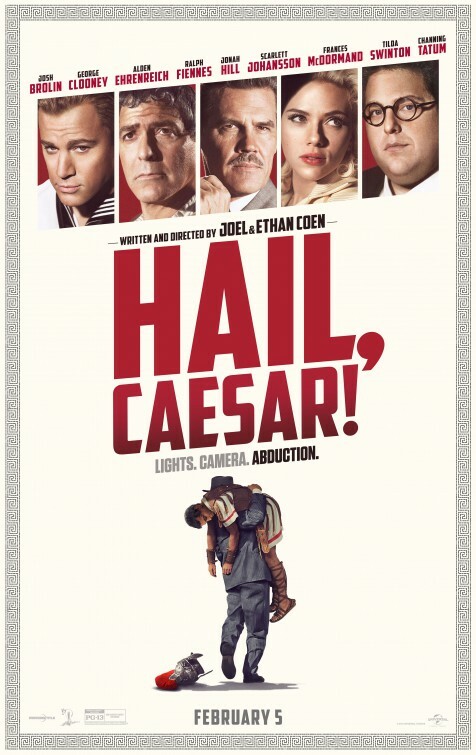 Oscar nominated this year for their script of Bridge of Spies, Joel and Ethan Coen (who also adapted Unbroken in 2014) have several moments in Hail, Caesar! that fire on all cylinders. A discussion between four holy men and Mannix about the religious sensitivity of the biblical epic being filmed is a highlight and a perfect example of the dynamic wordplay that have defined much of the Coens careers. Then there are the frequent stretches that philosophize past their welcome and make the wait between the lighter moments seem that much longer. Frustratingly, I’m sure these are the passages of Hail, Caesar! that Coen aficionados will recreate in their living rooms while watching Intolerable Cruelty in their Big Lebowski slippers. Performances are on par with what we’ve come to expect from an off-killer Coen production, zany, unpredictable, and sometimes directly out of left field. McDormand’s small role as a chain-smoking film editor feels like a Bugs Bunny character come to life while Swinton’s rapid-fire reporter seems to have emerged directly from a Howard Hawks film. Clooney is charming in his ego-less way and while Tatum overshoots his pretty boy hunk role by a mile (even with precious little dialogue), he somehow fits perfectly into this world. Brolin has the toughest role, the straight man, and he’s more than capable of holding it all together. Hail, Caesar! isn’t up there with the Coen’s best but it’s a nice reminder that when they want to goof off they still know how to let loose and have fun with their friends. A quick note about the ever popular topic of diversity…recently the Cohens caused a bit of a dust-up when asked about diversity by a reporter. Brushing off the question and never really answering the reporter, it’s interesting to consider that there are but three minority characters in the film (a Carmen Miranda like starlet and two employees at a Chinese restaurant, with maybe 8 lines of dialogue between them)…and over the course of their 17 movies, only three minorities have ever played leading/supporting roles in a Cohen film.